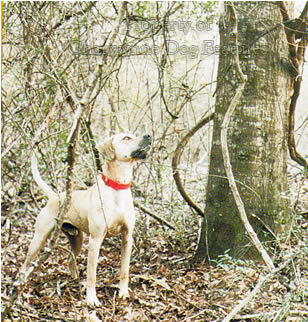 Very much developed in the United States, in north-east Louisiana, is the rather dramatically named Catahoula Leopard or Hog Dog, Catahoula meaning beautiful clear water. A muscular, Dalmatian-sized hound, but used extensively as a herding dog, they are usually black merle, with their black patches earning them their breed title. They can also be solid-coloured: black, blue, red and yellow-tan, the coat colours long associated with the mastiff breeds. 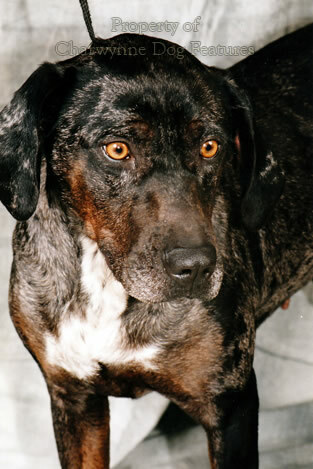 The distinctive black merle is also found in Great Danes and the Norwegian Dunker Hound. Possessing the classic phenotype of the running mastiffs, they are versatile hunting and herding dogs, able to hot track lost stock, bring it to bay when found and then 'hold it'. This is a difficult task with defiant semi-wild cattle and wilful half-wild hogs. These dogs are often used in teams, with specialist roles: leading, herding or rounding up and driving in the destined direction. They combine this testing task with that of hunting dogs, where they can exercise their 'par force' hunting skills, using sight and scent, their great stamina and immense determination. Skip and Vicki Loudenslager of the Cottonwood Kennels, Lake Odessa, Michigan, have had Catahoulas for eleven years and bred nine litters in that time. They have the first two UKC champions, the first three grand champions and the first UKC agility champion on record. So far, they have produced 13 UKC champions. Their red dog Trace came 2nd out of 25 dogs at the National Association of Louisiana Catahoula's (NALC) show. Skip hunts them on raccoon and is anxious to keep the working instincts of the breed alive. He tells me that his dogs hunt more as sighthounds, do not run cold tracks, bay like a scenthound or have the latter's temperament. He stresses that his dogs will cease tracking once they see their quarry, the classic once-favoured technique of hounds hunting 'at force'. 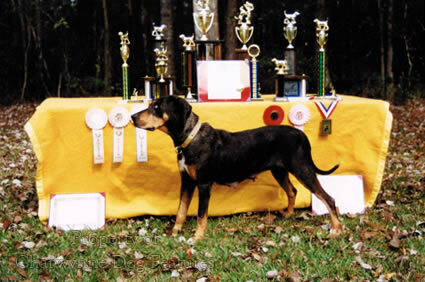 Don Abney of Abita Springs, Louisiana, the author of a book on the breed, is a NALC certified breeder (and trainer of all breeds), using his Catahoulas across a range of skills. This is an extremely versatile breed, able to hunt, track, herd and compete in agility trials. Registered as the Louisiana Catahoula Leopard Dog with the NALC, the UKC (United Kennel Club), the ARBA (American Rare Breed Association) and the SKC (States Kennel Club), but known informally as the Catahoula Cur, the breed is listed in the Herding Group for show ring purposes. That may recognise their pastoral skills but is scant reward for their sheer versatility. Some researchers have linked this breed with dogs brought to the Americas by Spanish colonists, to be subsequently acquired by Indians and later by settlers. There are theories too of the introduction of the blood of herding dogs brought out by French immigrants, with the harlequin coat (what the French call 'gris avec taches noires [danoises]') of the Beauceron, perhaps in mind. But there is a genetic difference between harlequin and merle. Smoother-coated, drop-eared dogs like the Norwegian Dunker Hound would be a more likely foreign source. Interestingly, my namesake, the highly successful English lurcher breeder produces collie/greyhound lurchers with this type of physique and striking coat colour and they are superbly efficient hunting dogs. As Sullivan wrote a century ago: "Form follows Function". 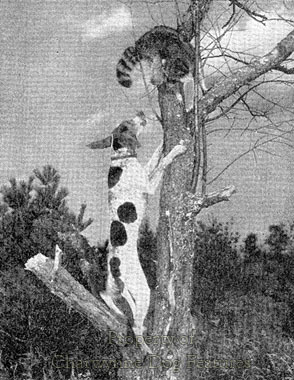 Known affectionately as 'cats', used successfully as coonhounds, these Leopard Dogs have been described as 'walking sledgehammers' because of their forcefulness and sheer physical power; they are today's equivalents of medieval par force hounds. Earlier, I described how the American hunter Shelley used hounds from his country in his 'bobbery pack' of lion-hunting dogs in Africa in the 1920s. 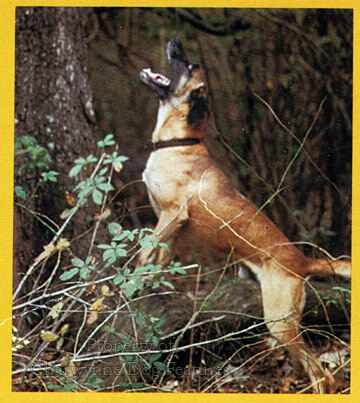 In his 'Jaguar Hunting in the Mato Grosso' of 1976, de Almeida wrote: "...good dogs are essential to a successful hunt. And good jaguar-dogs are the hardest thing to come by in Mato-Grosso...We arranged for Bert to send down to us six hounds of the Plott breed, which were trained to hunt bear in the forests of Washington State, near Seattle. This race of hound is famed for its courage, having been bred over the years strictly for hunting big game...The Plott breed is an overall brindle colour, but varying from orange in some dogs to almost black in others." Once again, a famous big game hunter is singing the praises of brindle hunting dogs, brindle running mastiffs. Known affectionately as 'Ole Yeller' because of its coat colour, the Black Mouth Cur or Southern Cur, of the United States, has all the uses and appearance of a running mastiff. Weighing up to 95lbs, with a height at the shoulder of up to 25 inches, these versatile hunting dogs have been used on quarry ranging from squirrel and raccoon to bear and boar. Famous for their long loping stride, great stamina and even more impressive gameness, they hunt and catch their prey, never flinching from closing with fearsome adversary like boar. They can work stock too as can so many of the mastifflike breeds. Short-haired, with a coat varying from light red, through golden yellow to fawn or sandy yellow/tan, they usually feature a black mask and muzzle and sometimes have white toes or a small white spot on their chest. They resemble the Rho desian Ridgeback, without the ridge. They are silent on the trail, but give a characteristic 'yodel' as they close in on their prey. With a strongly developed desire to please their masters and great hunting skills, they have proved their worth over the years on many remote farms. Such dogs deserve more recognition, especially when you consider that given to purely ornamental breeds that have never worked to help man survive in testing times. If breeds like these two American breeds, the Broholmer, the Rhodesian Ridgeback, the Dogo Argentino and the Great Dane are to thrive they must be bred in the mould of their hunting field ancestors. The powerful strong-headed running mastiffs may no longer have a role in Europe as big game hunters, but they are a distinctive element in canine heritage as well as fine breeds in their own right. They must be bred, as the Danes insist with their native breed, with superlative temperament and sound character. There is no place in today's society for big, powerful savage dogs. There is still a need however for well-disciplined faithful dogs with a natural guarding instinct and that is the challenge for breeders in the 21st century. "Undaunted in courage, the true boarhound would rush on his game without hesitation and almost as certainly he ran on his destruction. These valuable dogs, therefore, were not so frequently allowed to attack the boar 'at force', as formerly, at the first onset, but were purposely restrained until the boar had become somewhat exhausted." 'An Encyclopaedia of Rural Sports' by Delabere P. Blaine, 1870.